A look back at the past year may help us be alert to problems ahead. Here’s a summary of the most common problems received in the diagnostic lab on woody ornamentals in 2018. 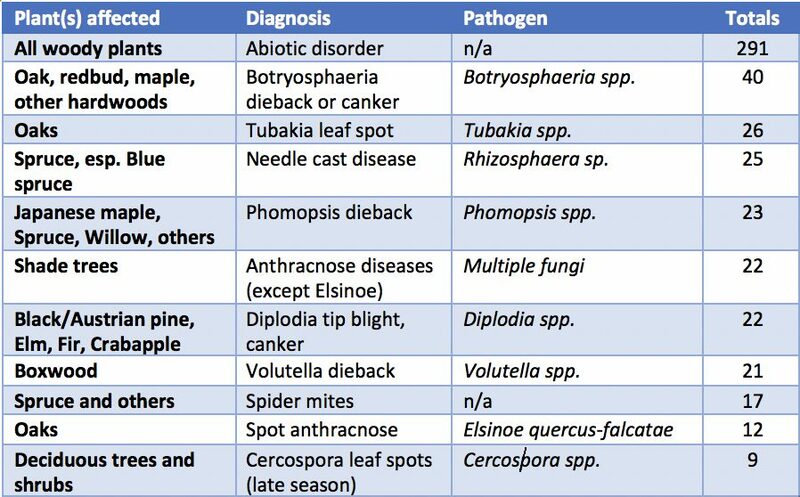 As is typical for most years there were more non-disease (abiotic) problems than infectious (biotic) diseases found on PPDL lab samples in 2018 (see Table 1). 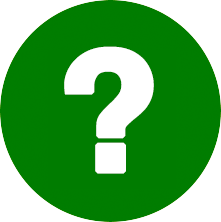 These abiotic problems include aggregate counts of everything from poor planting practices to soil conditions and environmental factors. The table also shows the most frequently diagnosed infectious disease problem was Botryosphaeria dieback or canker, which was found across a range of hardwood trees and shrubs including: Maple, Magnolia, Crabapple, Redbud and Oak. The most commonly submitted leaf disease was Tubakia leaf spot on oaks, which is usually more severe on the red oak group. We also had our first recorded samples of Bur oak blight (Tubakia iowensis) on Bur oak and on Swamp white oak in Indiana this year. Most spruce samples we receive are found to have Rhizosphaera needle cast disease, but in the last 2-3 years we’ve seen an increasing number of samples with dieback caused by Phomopsis infections. Anthracnose leaf and twig diseases show up every year on maple, sycamore and oak in late spring and early summer. This group of diseases are worse during rainy weather and in 2018 we saw cases of anthracnose throughout the growing season. Volutella dieback of boxwood was common in 2018 and for the first time in Indiana we confirmed the Boxwood blight fungus on boxwoods in shipments sent to retail home and garden stores from a supplier on the west coast. In December, we confirmed boxwood blight on infected boxwoods in a residential landscape. A suspected infected boxwood had been added to this landscape early in the year, acting as a ‘typhoid Mary’ to infect established boxwood plantings. Our publication on boxwood blight and a new article on identification of this disease are available. Spider mites (both cool season and summer types) were the most commonly encountered among the arthropod pests. Bacterial leaf scorch (caused by the systemic bacterium Xylella fastidosa) was identified on five oak samples submitted to the lab this year while oak wilt was detected only three times this year. While these numbers are low both diseases remain important diseases to watch for on oak.